Bechdel Test: PASS-Angelica, Peggy and Eliza discuss Martha Washington. As I said in my last review, my February reading was entirely dedicated to Hamilton, in preparation for me going to see the show in London (saw it last week, it was INCREDIBLE, and I cannot believe that was only a week ago!). I was really disappointed in the first book I read, Alex & Eliza as it was incredibly historically inaccurate and just not a particularly engaging story. I’m happy to say that this book fared much better for me, it was clear the author had done her research (IT HAD A BIBLIOGRAPHY. My historian heart is very happy) and although the title was a bit of a misnomer, since Hamilton is not in the book very much, I still really enjoyed it and came out with a newfound appreciation for how awesome Peggy Schuyler was-And Peggy should never be used as an insult, because Magarita Schuyler Van Rensselear was one badass woman! The colonies are in the throes of the Revolutionary War and caught in the midst of spies, traitors, Loyalists and Patriots, is the charming, quick-witted Peggy Schuyler—youngest of the famed Schuyler sisters and daughter of General Philip Schuyler. Her eldest sister Angelica, the “thief of hearts,” is known for her passion and intelligence, while kind, sweet Eliza has a beauty so great, it only outshone by her enormous heart. Though often in the shadows of her beloved sisters, Peggy is talented in her own right—fluent in French, artistically talented, and brave beyond compare. When a flirtatious aide-de-camp to General Washington named Alexander Hamilton writes an eloquent letter to Peggy asking for her help in wooing the earnest Eliza, Peggy is skeptical but finds herself unable to deny such an impassioned plea. Thus begins her own journey into the Revolution! So I guess first off, I have to talk about Peggy because she was AWESOME. I honestly didn’t know much about Peggy before reading this, since she’s kind of an afterthought in Hamilton the musical, so getting to see what a smart, kind, adventurous woman she was, was brilliant. I loved getting to see Peggy get involved in the action of her father’s spy rings, and her going back to save her baby sister when the Schuyler home was raided by Redcoats, it was just great to see a 18th century woman who was determined to be just as involved in the action as the men were (or at least as much as she could get away with given society at the time). Obviously I loved seeing her relationship with her sisters, but what really surprised me was Peggy’s relationship with her father, I had no idea that the two of them were so close and it was really heartwarming to see. I loved the use of the real historical letters at the start of every chapter, I thought that added a nice touch of realism and once again, showed that the author had really done her homework which is always nice to see, she mentions in her afterword that some characters’ dialogue is directly lifted from letters they wrote, which I thought was awesome! I did feel like some of the chapters were a little overly long, and that the plot dragged in places, there were a lot of details about the Revolutionary War, which I enjoyed, but probably wouldn’t be for the non history student minded people out there. The spy ring that Philip Schuyler ran was of particular interest to me, as I had no idea that he did that and I found that I had a lot more admiration for him after reading this book as the musical obviously doesn’t really touch on anything that the Schuyler patriarch did. The ball chapter was a particular favourite of mine, I’m sure to no one’s surprise because if there’s one thing I love in a book, it’s a ball! 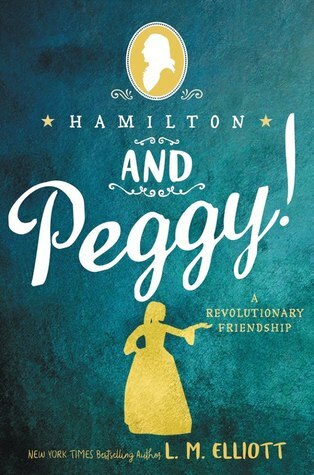 The title is a little misleading, because Hamilton is actually barely in this book, he pops up a few times, but it is largely Peggy’s story. I did like that because it allowed me to see just awesome Peggy Schuyler was, and his friendship with her was pretty amazing, it’s the kind of banterous friendship that I always love in books, but for those going into this expecting a lot of Hamilton because his name comes first in the title, don’t. This is very much Peggy’s story. It was nice to see a more nuanced portrayal of Hamilton in this than I’d seen in Alex & Eliza though. I liked that we got to see the whole Schuyler family, and how Peggy was so sweet with her younger siblings, apparently she did do a lot of caretaking of her younger siblings in real life, so it was nice to see that portrayed here. I did kind of feel that Eliza was downplayed a bit in order to make Peggy seem even more amazing, I understand that the author really admires Peggy, but Eliza kind of gets the short end of the stick as she comes off as the weak, insecure sister and from what I know of Eliza the woman, I don’t feel like that’s true at all, Eliza was incredibly strong to survive so much tragedy in her life and it would have been great if the author could have brought how amazing Peggy was to our attention without bringing Eliza down. I liked the structure of the three parts with the prelude, interludes and postludes, I thought that was a great way of breaking things up and that it worked quite well, as each section of the book covers a different stage of the Revolutionary War. Angelica was just as witty and brilliant in this book as I expected, but I did feel quite bad for her, I don’t know if her marriage with John Church (referred to by his alias Carter in this book) was really as strained as the author made it seem, but it was quite clear in this that she wasn’t all that happy with him. I liked that this book introduced me to a load of players in the Revolutionary War that I had no idea about before, like Colonel Richard Varick (his crush on Peggy was sweet but misguided! ), Moses Harris, Fleury etc. I especially loved getting to see Martha Washington and the way this book portrayed her has me really interested in going to look up her real life history because I thought she was awesome in this. I was a little bit distracted by the fact that Peggy’s aunt, Gertrude Cochran, had the nickname Gitty though! It was nice to see Native Americans in this and the role that they played in the Revolutionary War as Hamilton the musical doesn’t touch on this and I had no idea the Schuyler family had such close ties with the Oneida. I can’t really speak to the representation, as I’m not from that community, I didn’t notice anything blatantly offensive in their portrayal, but obviously don’t take my word for that. The writing style wasn’t always my favourite, it was quite formal which worked for the time period but I did find it was a little stilted at points. I had no idea about Fleury, Peggy’s first and very brief romance, I honestly thought she basically fell in love with her cousin and that was it, so it was nice to see that and how that affected her view on marriage (and that there was actual historical evidence of this dalliance!). I kind of wished we got to see more of Hamilton and Eliza’s wedding, but it’s not their story, so I totally get why we didn’t. I thought the ending of the postlude was really lovely, showing everyone celebrating the end of the War and the first hints of Peggy’s romance with her eventual husband, that was such a nice positive note to end things on. Also these things might be incredibly history nerdy of me, but I loved the afterword where the author explained what was historically accurate and what was a little embellished, that and the bibliography just made my nerdy heart incredibly happy. Overall, this wasn’t the most action packed or exciting book ever, but it was a nice insight into a greatly overlooked historical figure and I appreciated how much detail and research went into producing what was a generally pretty engaging story. My next review will be of A Curse So Dark and Lonely which I finished on Wednesday, so it should be up relatively quickly for you, probably over the weekend.